Here’s a little history of who I am and how I became Artfully Sew. I grew up here in Wisconsin and love my farming state. My husband, Tom and our three children currently live in the country. I love the inspiration I have out here with the sand hill cranes, fields of crops, and beautiful sunsets. I have always love to create things, but it wasn’t until the last 10 years that I started quilting. Traditional quilting got old for me quite quickly. I didn’t like the utility side of constructing quilts, stitching square after square together. Then my best friend’s mom gave me a box full of hand dyed material, some Quilting Arts Magazines and taught me how to use fusible webbing – I was hooked! Most of my designs are original; meaning I came up with the pattern on my own, but I am inspired by other artists, nature and photography (my husband, Tom is a photographer). The creation process is the fun part for me. I often don’t have a final project in mind but create as I go. Fun, fun, fun! I am also a musician. I love to sing and play guitar, piano and even accordion! I work part time at my church, Fond du Lac Community Church (http://www.ccfdl.org/) as the Music Ministry Assistant. My favorite job of all has been being a wife and mother to my family. I am blessed beyond comprehension and will keep quilting, mothering and making music as long as God allows me. I am a simple girl, simply put. I wear my heart on my sleeve and I can’t keep a poker face. It’s taken me years to be okay with that – to accept myself just as I am, just as my Creator accepts me as I am. That’s why I often sign things with that phrase, “Just as I am”, because that’s who I am! So, thank you for visiting my Artfully Sew Shop! Please stop by often and I hope that I’ve brightened your day with my little store of quilted and embroidered things. 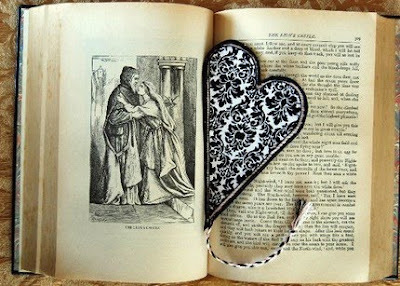 This Damask Heart bookmark is an original design that is machine stitched with damask cotton fabric and a bit of soft pink fabric accented around the edges. It is hand embroidered with a blanket stitch and the back is finished with black felt. It’s bookmark day at Bibliophilic! They have some awesome marker giveaways until 12 midnight and we write a guest post for the fun! Go over and check it out! 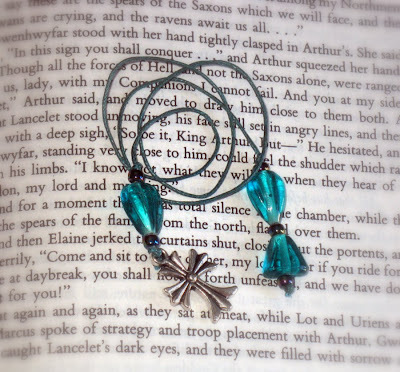 Today’s bookmark giveaway comes from Etsy seller ARemarkYouMade. I have awlays been fascinated by dragonflies and we have a lot by our home…so I adore these! Your home should be a retreat and a reflection of your style. At A Remark You Made, we are constantly striving to create new items to enhance everyday living and entertaining by bringing natural organic fibers, wonderful textures, and eco-friendly style into every room. Many of our items focus on the natural beauty of an object, turning it into something special for everyday use in the home and are hand crafted from the wood of down trees. Sustainability is very important, and my products provide lovely green accessories and embellishments full of rustic and natural charm without sacrificing style and elegance to help you live a greener, healthier, and happier lifestyle. 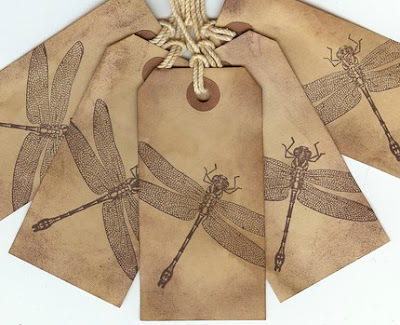 These coffee-stained gift tags are made from craft shipping tags and hand stamped with a dragonfly design in a chocolate chip ink color. 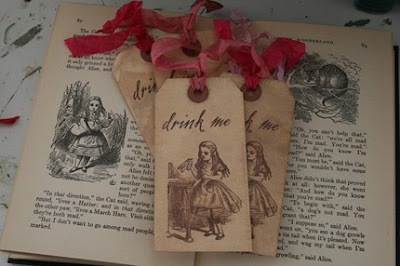 The edges have been sponged in a coordinating color to add dimension and a white string completes the look of these whimsical tags. 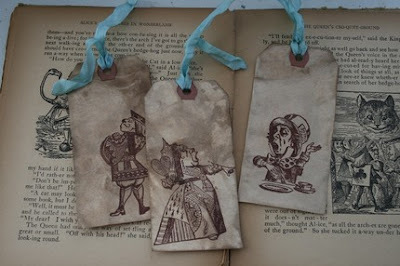 These tags are a perfect embellishment for gift bags and boxes, scrapbooking, baked goods, and more. Try using one as a bookmark. You will receive the set of 5 tags shown in photos. Contest ends on April 15, 2010 and is open internationally. Please email us of you cannot comment below. Thanks and Good Luck! Today’s bookish giveaway is inspired by the book “Devil’s Kiss” by Sarwat Chadda and is brough to you by Bad Candy Studios –the brainchild of three creative friends–Heather, Maureen, and Amanda–who wanted an excuse to get together and make things more often. We specialize in handmade note cards, including invitations and announcements, though we’ve also been known to dabble in everything from prints to jewelry to thumb tacks. If you like what you see here, you can also check out our other non-snarky stationery at http://papercupcakestudios.etsy.com/. Gretchen Vandervort of Bad Candy Studios made and donated FIVE templar book thongs for our blog readers! Contest ends on April 5, 2010 and is open internationally. Please email us of you cannot comment below. Thanks and Good Luck! Today’s giveaway is for a beautiful 5X7 Photo collage along with an Artist Trading Card with a Faerie on it by Etsy artist Whymsical Musings. I Love art in all of it’s forms. I live in rural Oklahoma where nature Inspires and Enlightens me. I am a Mother of 4 grown children and a Grandmother of 5 precious angels. I have 3 dogs and 4 cats. My pug Buddah is my very best 4 legged friend. I have a wonderful husband of 30 years we were high school sweethearts. I love to read and write and I can cook a mean meal. i am a stay-at-home mom of 3 beautiful kids. i have the most awesome hubby in the whole world and God has blessed me more than i can express! i love to create pretty much anything and everything! i am a stay at home mom of 3; ages 3, 15 and 16. in my “spare time”, i am a youth leader to the teens at our church. our home seams to have a never ending stream of kids coming and going…which we LOVE, but can get exhausting at times! i have been creating since i was 4 years old, thanks to my very supportive family and their belief that i am the best at anything and everything i do, even when it is not true 😛 ! I love to travel and, although, i have not traveled much, i had the awesomely rad opportunity to visit russia—while it was still the USSR….one of the best experiences of my life! my hobbies include baking, cake decorating, scrapbooking, art journals, book making, jewelry making….oh, let’s be honest, if it’s creative, i probably do it, have done it or would like to do it! Good Luck Contest ends March 1st, 2010 and is open to International Entries.